This weekend we spent the day at Australia Zoo. Those that remember Steve Irwin the Crocodile Hunter will know that this is his zoo that his family now run. I used the fairly lenghty drive to work on my current crochet project, a blue/green ripple. The zoo is probably the nicest, clearest ones I’ve visited. All the animals are kept in large enclosures and seemed to be very happy and not sleepy unlike every other zoo I’ve been to. They have native Australian animals such as kangaroos, koalas, snakes, and birds as well as giraffe, zebra, and tropical birds. The zoo is massive!! I couldn’t resist posing with a kangaroo with my crocheting! If you ever get to the Sunshine Coast in Queensland I highly recommend you check this place out. They have busses leaving from The Gold Coast and Brisbane too! 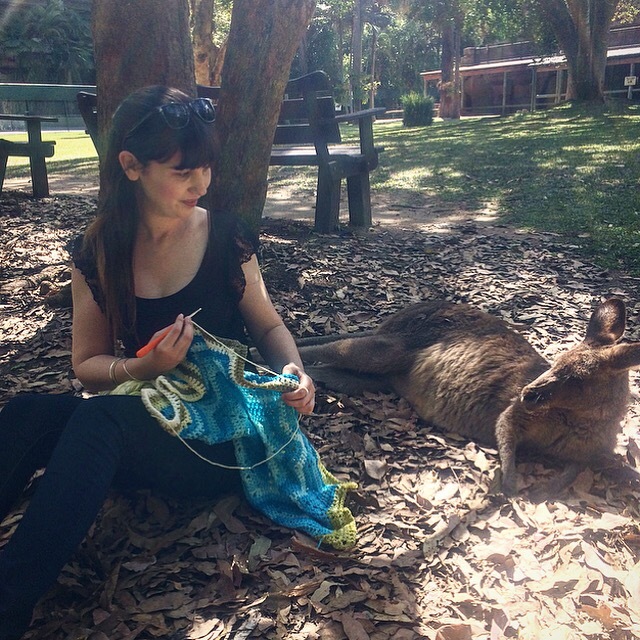 How cool to crochet next to a kangaroo!! !